Smartphone manufacturers are leapfrogging themselves with every new generation of their products, and the same thing goes for their tablet endeavors. Every new top-shelf tablet is slimmer, lighter and faster than the previous one, but there is a certain difference between how things stand in phones and tablets. While Apple is no longer the undisputed leader in the smartphone space, it still has a firm grip on the tablet market, where the iPad manages to remain on top of its mobile OS-powered opponents at all times. 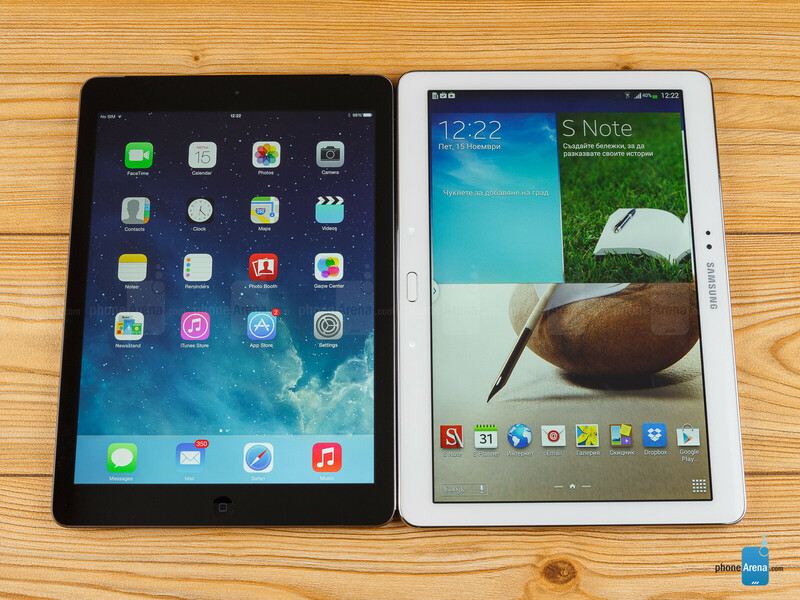 The iPad Air, which only recently became available, has set the standard even higher in terms of design. With its thin side bezels and super-light weight, Apple's full-sized tablet is more alluring than ever. However, what it'll go up against this time is the Samsung Galaxy Note 10.1 2014 Edition – arguably Samsung's best Galaxy tablet, which hopes to attract consumers with its S Pen and productivity-focused features. Let the fight begin! 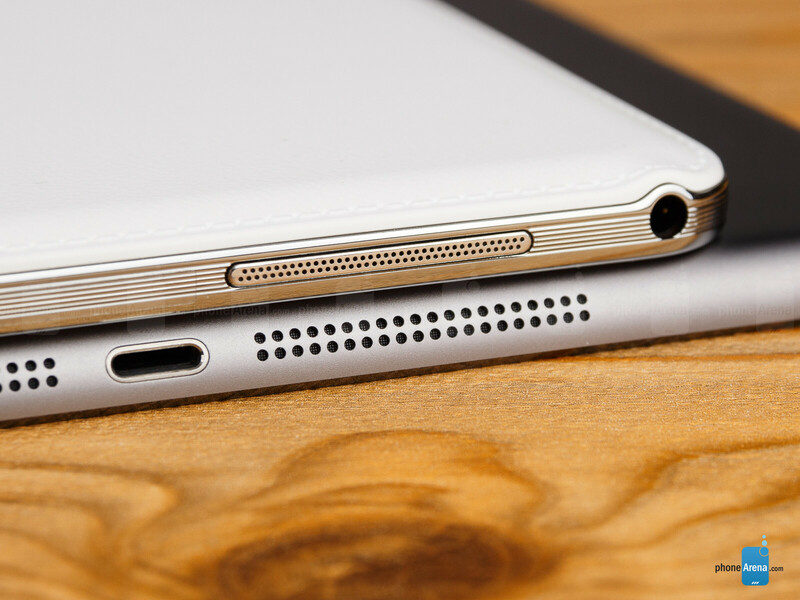 The Galaxy Note 10.1 2014 Edition isn't anything extraordinary in the design department. While it's respectably thin, it's still made of plastic and presents us with an odd back panel that has a pattern resembling leather. It's by no means bad, but it's just 'meh', compared to the fancy aluminum build of the iPad Air. The Air is more compact than the Note 10.1 2014 (9.45 x 6.67 x 0.30 inches for the iPad vs 9.57 x 6.75 x 0.31 inches for the Note), and it's also significantly lighter with its 16.86 oz (478 g), compared to the Note's 19.29 oz (547 g). This allows you to hold the iPad Air much more comfortably, regardless if you're using one or two hands. Obviously, the iPad Air can offer you a way more premium design of the two, and that also translates to the physical volume and power keys of the devices, which react better on the iPad. Anyway, there's one thing that stands out in the Galaxy Note 10.1 2014's design and that's the microSD card slot, which is going to come in handy in case you want to expand your storage at some point. Both devices have versions with cellular radios, and thus – SIM card slots. However, note that the iPad Air uses the Nano SIM standard, while the Note 10.1 uses Micro SIM. There is a small difference between the sizes of the displays of these two lovely tablets. 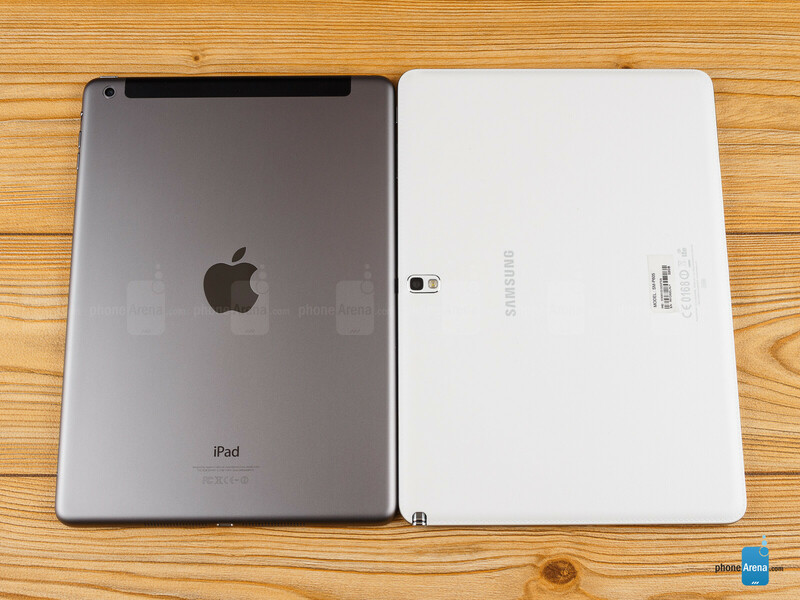 The iPad Air's one measures 9.7” (the same size as on any other iPad), while the Galaxy Note 10.1 is slightly bigger with its 10.1 inches (what a surprise!). Resolution-wise, the iPad is quite a solid performer with its 2048 x 1536 pixels (264 ppi), but the Note 10.1 2014 takes things a couple notches further with its resolution of 2560 x 1600 pixels (299 ppi). 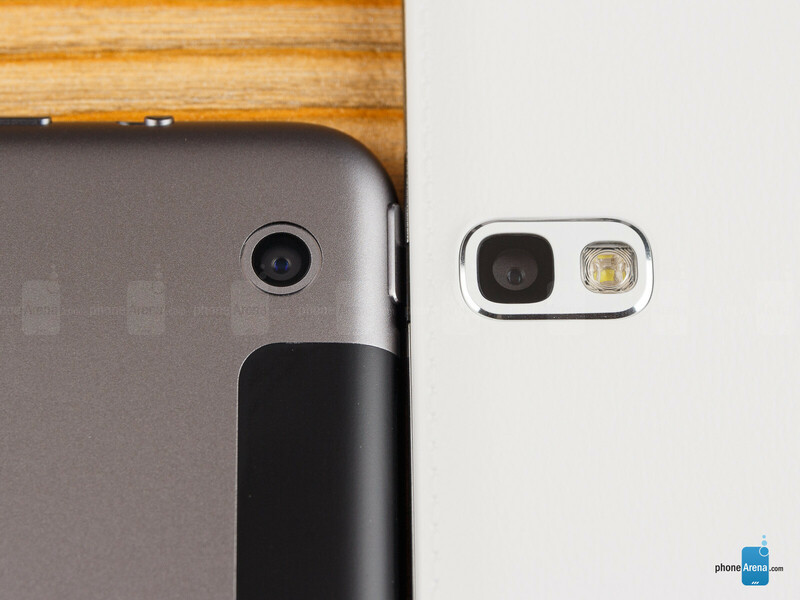 Both look very clean and detailed, with the Note 10.1 being a bit better in this respect. We should also note that there's a substantial difference when it comes to aspect ratio. The iPad Air stays true to 4:3, which makes it very convenient for web browsing and reading, while the Note 10.1 has a 16:9 display that's more suitable for video playback. Inspecting both display panels positioned side by side, one of the first things that we notice is that the gamma of the iPad Air's screen is a bit off. Certain dark levels appear brighter than they should be, resulting in a less contrasting image. Indeed, since this problem isn't present with the Note 10.1's display, its own image looks a bit more attractive at first glance. While both displays use LCD technology, the colors of the iPad Air are more realistic and well-balanced, as those of the Note 10.1 2014 appear somewhat greenish in comparison. Viewing angles seem to be about the same with both screens. The Galaxy Note 10.1 2014's most unique feature is the S Pen stylus. Of course, you can get a capacitive stylus for the iPad Air, but it'll be a much worse solution, because the S Pen uses Wacom technology. It's very easy to write with and supports pressure sensitivity. If you fancy the ability to take hand-written notes or draw using a stylus, then this is the feature which should make you consider the Galaxy Note 10.1 2014. To choose between these two great tabs is really difficult. Definitely the best tabs so far. 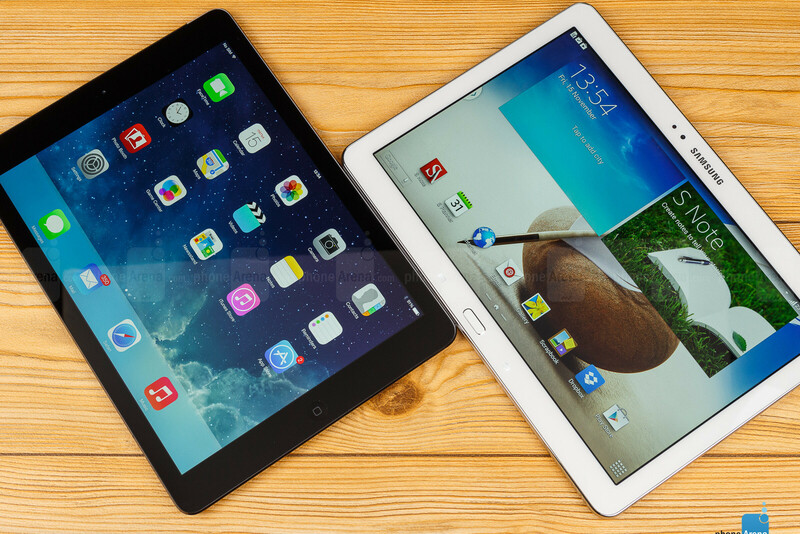 Costco is giving $100 off the Samsung 10.1 and other Samsung tablets as well. In fact, Costco has been discounting Samsung tablets for a long time. I understand Samsung wants people to believe their tablets are worth the MSRP -- but just try to sell them, and you will see these Samsung tablets just don't hold their value. Think about it -- if brand new Samsung tablets are being discounted at the getgo, it's a strong signal you've just wasted your money. A $100 discount off the 10.1 is not an insignificant amount. You buy tools to use them not to sell them. Or? Is it more like clothes for you? Of course you do. You may also respect others' freedom transferring your personal data to their sites. Freedom? Freedom to do what? Choose from a list of screened widgets to add to the home screen at the cost of battery life (for $5 a widget of course)? I've owned android and ios devices, and the "freedom" everybody talks about is an illusion. You are faced with the same constraints on an android device. So, in your book iOS not having any widgets at all is a feature? Hmm, since when does having a possibility and not having a possibility equal the same? Battery life? Oh, another good point for Android: On Apple devices, your are stuck with the standard battery. On Android, you can easily buy more of them. I got 4 for my galaxy Note and bigger ones too than standard, cost me 40 bucks extra and I can exchange them, so I have enough power for continuous use for a intercontinental trip to Europe. No, that Android is the same dumb restrictive system than iOS, nobody that knows both will believe that. More restrictions of course equal less brain use and easier to use for tech stupid users, I admit that. But then I am not one of these 5 braincell users ;-) I got my widgets for free by the way, I don't know what you are doing wrong. Yes, on iOS all the apps are more expensive too, but don't assume that for Android. Question: Do you really have an Android device or are you just pretending? I feel sorry for the losers who buy any of these products. I think you prefer Nokia 2520, but as far as its a RT tablet, its not a good choice. I feel sorry for you...what you say does not make any sense. I can't wait for Sony's next years tablet. Even if I hate tablets though lol. Cool comparison. I couldn't find any hints of bias... let's see what the trolls will say. Keeping my data in an iPad has lock me into the respective app and the Apple eco system. Data portability is an issue. Take quite a big effort to move my ipad data out thanks to Springpad. Its a multi platform able to access thru PC Mac iPad and Android. I basically cut and paste my way out of iOS data lock down. A lot of people mention rt lack of apps, considering that all the apps which are over 100k are optimized or the tablet, in contrast with android which Im not sure how many apps are optimized, but things that kind of impressed me on the windows tablets, rt or not is the fact that you can truly multitask, if Im in the browser and get a skype call, it will put the browser to the side of skype , so I can still browse and talk. Yes I know that the note 3 has multiwindow, but is limited to the apps supported, which is not everything out there. Where is the spec comparison chart? They are both over-priced (esp the ipad). Note 10(black version) is more beautiful and comfortable to hold, than iPad Air. For such big device , thin side bezels on portrait mode , are pain. No matter how light the device is. If your going by which tablet is faster and can do more. The note is an easy win. I don't like Android tablets but come on already with the iPad. I feel like any tech writer that's writing a review or comparison with the iPad coming out on top is lazy. It's a cop-out. Everything that the iPad does well in these reviews is punctuated and everything that the competition does well is mentioned then glossed over with little praise. At the end of the day the iOS app store is going to beat out the competition but this isn't supposed to be a review about the "app ecosystem" it's about two competing devices. There's never a mention in these reviews about how annoying it is to have to use iTunes for everything with the iPad. No mention about how there's no file system and sometimes no simple way to take a file off of the iPad to open on a computer or other device. At least Android devices use the simple tried and true notion of "drag and drop". Expandable memory slots are also a great way to share media between devices which are forever lacking on iOS devices. I think it's great that the Galaxy has "dozens of settings within almost every app". Sometimes there isn't enough control in iOS. Every time I open the iOS Facebook app I get a dialogue box telling me I should turn on WIFI for better location accuracy. Same goes for when I open maps. It would be nice to have a setting to turn that off. There are tons of frustrating quirks in iOS that never get mentioned that would be totally picked apart and harped on if it was on an Android device or Windows Phone during a review. I'm not knocking the iPad, I think it does what it does well and it's the most elegant tablet design but these writers need to be more original or just stop writing about Apple products. Your expandable memory slot argument reminds me of the Iomega Zip drives. It's the same argument when the 3.5" floppy drive was discontinued and we went to CD drives. The unfortunate thing is technology continues to advance -- storage will be cloud based. Expandable memory devices are relics of dated technology. The reasons I can think of using physical memory devices is for archive and security. I for one appreciate having the best of both worlds. I don't care to much for cloud storage, I don't usually use it and yes you are right about Security. I like that Samsung hasn't taken that choice away from consumers.